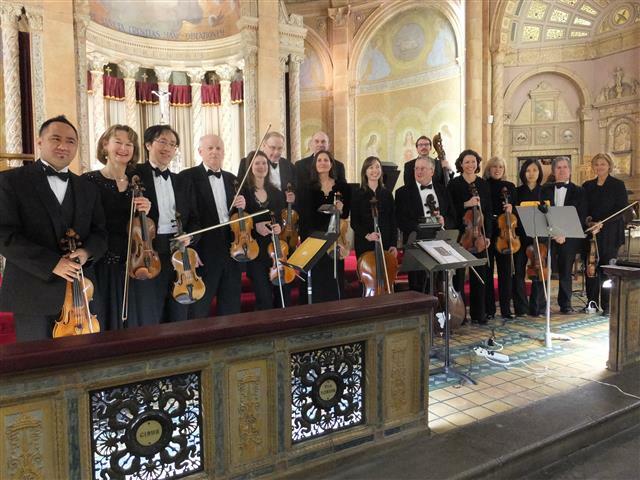 We’re still on an musical “high” from the March 29, 2015 performance of “Mozart Noir” by the Camerata di Sant’ Antonio Chamber Orchestra, under the direction of Christopher Weber. From Samuel Barber’s Adagio for Strings, dedicated to the memory of our former music director, Bridget Blesnuk, through the U. S. première of Samuel Coleridge Taylor’s Haytian Suite Op 51a, and Harry Burliegh’s arrangement of Sometimes I feel like a Motherless Child, we were treated to amazing symphonic music in our church’s splendid acoustic. And thanks to the commentary of conductor Chris Weber, we also came away with a new knowledge of black composers Chevalier de Saint Georges, Samuel Coleridge Taylor and Harry Burliegh, as well as an appreciation of their musical compositions. For additional photos from the Camerata’s appearance at Blessed Trinity, Click HERE. You have one more opportunity to enjoy the Camerata this season. They will be performing the music of Giachino Rossini, the Italian Mozart, on Sunday, May 31, at 2 p.m. at Holy Trinity Lutheran Church, 1080 Main Street, Buffalo.